At this blog and my other blog, The Perpetual Page-Turner, I don't really use star ratings on my reviews anymore because it just got too complicated for me personally because I couldn't justify giving 4 stars to a book I REALLY enjoyed that was maybe more "fluff" than a 4 star book that was maybe more profound. ANYWHO. I do still give star ratings most of the time on Goodreads (come be friends with me if you feel like we have stuff in common!) so I figured I'd share my latest 5 star reads! 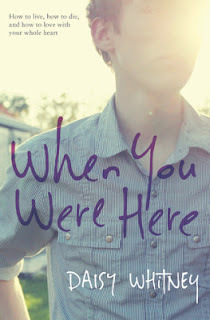 When You Were Here by Daisy Whitney: Ok, so this book isn't out until June but I had the opportunity to borrow it. AMAZING. Please pre-order this book now if you like YA contemps. Danny, the protag, has just graduated high school two weeks after his mother has passed away from cancer and sets off to Japan, where his family had a second home, for answers to questions about his mom during her last months and how to keep living himself. There's some romance, great meanderings through Japanese streets and soul shaking self discovery. I ugly cried like no other for obvious reasons and for some not so obvious reasons. Don't dismiss this as "just another grief book" because there's so much to this one! Read my initial thoughts on When You Were Here! The Statistical Probability of Love At First Sight by Jennifer E. Smith: Le swoon! If you like cute contemporary YA romances, this one is sure to fit the bill! It's seriously adorable and I read it mostly in a day. I can't believe it took me this long to actually get to it but LOVE! Definitely reading more from Jennifer E. Smith soon! 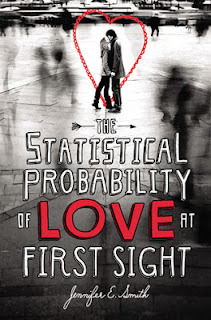 You can read my full review of The Statistical Probability of Love At First Sight! Just One Day by Gayle Forman: You know I'm a Gayle Forman fangirl if you read my reviews of If I Stay & Where She Went (so amazing!) so I was super excited to get this for review. I was really nervous because she's a FAVE AUTHOR and so she has so much to live up to in my eyes. LUCKILY, for me, Just One Day was incredible and exactly what I needed to read! I love self discovery stories (oh ok and swoony moments and romance) and I really connected to the main character and some of the things she was struggling with. Love when a book speaks to what I'm going through ATM! Sidenote: love that the main character was in college! 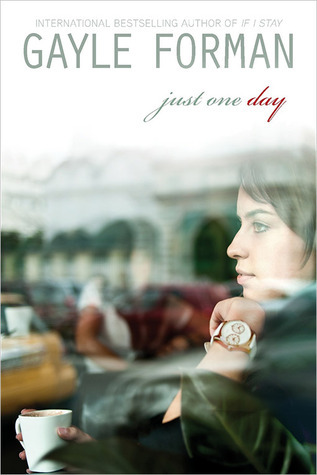 Read my full review of Just One Day here. I realized after writing this that all my latest 5 star reads are contemporary YA! OOOPS! My bad! I swear I really do have variety in my reading, you guys! Have you read any of these? Any on your TBR? I'm curious what were YOUR latest 5 star reads?? I'm always looking for EXCEPTIONAL books to add to the TBR or bump up my list! SLOPPY FIRSTS!!! One of my fave books ever! I have TFIOS on my shelf waiting to be read and I've heard so many mixed things about The Duff that I can't decide if I should pick it up. Some people LOVED IT and then the other friends of mine HATED it. I gave Just One Day 5 stars as well. I <3 Gayle Forman. My other 5 star book so far this year was Edenbrooke by Julianne Donaldson. I thought she really did pull the male voice off brilliantly as well! AND YEAH. CRYFEST 2013!! I knew I was going to cry for obvious reasons for myself as my mom also passed away from cancer and she ALSO said the same thing about making it to our graduation which she did and then passed away 2 weeks later after my sisters. So these types of books always make me cry. BUT there were so many unexpected parts that made me cry. She just wrote everything so perfectly. I can't wait until it gets closer to the release date for more people to read!! I happened to LOVE both Statistical Prob and Just One Day. In fact I think I comped them in my review. I did as well! I think they are definitely close to being readalikes though STAT was a bit lighter for me. I added WHEN YOU WERE HERE to my goodreads TBR list. Thank you! SO want to read JUST ONE DAY - love Foreman! I just finished the Echo Falls trilogy (an older MG contemp mystery by Peter Abrahams). The third book is a few years old now, but I just discovered the series. Really loved that - not sure I'd give it 5 stars, but worth a read if you like mysteries. I'm so excited about When You Were Here! So jealous you read When You Were Here! I want that so badly! Loved Just One Day and Statistical Probability too- such good books. Just One Day was also a five star read for me! I really enjoyed it, as you know. And I loved Stat too! I'm pretty excited for When You Were Here, thanks to your solid endorsement. I'm getting the sense that it's going to be a very, very good book! Just One Day and Statistical Probability are both on my TBR list right now. Can't wait to get to them, especially after your raves! My last six 5 Star books (according to Goodreads) were: Jellicoe Road, Code Name Verity, The Scorpio Races, I Capture the Castle, Saving Francesca and The Piper's Son. Please note that HALF of those were one author haha! I'm clearly becoming a Melina Marchetta fangirl. Also, I'm SO with you on the difficulty of giving a star rating. All of my Goodreads ratings are based on how I FELT about a book versus what I think it would earn on like a literary merit scale. Not that I don't also LOVE books with high literary merit. I just agree with you that I get too stressed trying to decide how to rate a book that I know is well-written but I found boring versus a more "fluffy" book that I loved. So, yeah. Top Ten 2013 Debuts Jamie's DYING To Read!